If you need a reliable auto shipping company, you have come to the right place. Premier Auto Shipping is your trusted one-stop-source for booking the best auto transport trucking companies nationwide. We provide the best price for your vehicle shipping and auto transport needs. Premier Auto Shipping provides the most professional, personal, and cost effective vehicle shipping service available. Our out of state car movers are some of the best and most reliable companies to work with in the industry. If this is the first time you have to ship a car, you should learn more about us, transporting your car, and some auto transport industry secrets. Fast Auto Shipping Services! We get your car on the road to it’s destination in days. Door-to-Door: Pick up and delivery service are standard for any of your auto moving company needs. Car Transport Tracking: Use our online car transport tracking service to track your order. 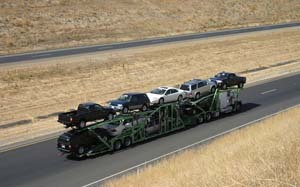 Fully Enclosed Car Transport: Nationwide enclosed vehicle shipping carriers are available. Guaranteed: Pick up and delivery dates are available for our car shipping rates. Fully Licensed & Insured: Your vehicle is insured by the carrier during transport at no additional cost. Looking to find car movers or a company that provides services to transport or ship your car or truck out of state? Trusting an auto shipping company is important; we minimize the risk with “no deposit” shipping reservations. That is what makes us one of the best companies to deal with. We treat you fair and deliver your vehicle on time for the quoted price – and no more. Moving A Car Out Of State? Premier Auto Shipping has been doing long distance car transporting for over 10 years. We’re a vehicle transport company you can trust. Premier Auto Shipping is a national auto transport company that provides auto transport and auto shipping services nationwide, including the following cities, Minneapolis, St. Paul, Miami FL, Las Vegas, Phoenix, Orlando, Tampa, San Diego, Portland, Salt Lake City, and Hawaii. We would be happy to answer any of your questions about the vehicle shipping process. We offer a free, no-obligation auto transport quote so you can get an idea of how much it’s going to cost. Please call us today or fill out our quote request form. Premier Auto Shipping is a Minneapolis based full-service auto transport company. We have been in business since 2004 as a Minnesota corporation. Our competitive rates and attention to detail sets us apart from the competition. Unlike most of our competitors, we offer service with no upfront deposits. Auto transport brokers perform front end sales, marketing, and dispatch services for the carriers; who in turn do the actual physical moving of your vehicle. These two companies must work closely together to assure a timely shipment and delivery of your vehicle. If you have any questions regarding our services or would like to request a free quote, please feel free to contact us.